One of my Dallas friends shot me a note and asked if I knew anything about these guys? I don't, but said I would post here and ask. Website/marketing is certainly good, and they have a pretty large fleet of Pipersports and other airplanes, but I don't know anything about them. Interested in the good, bad or indifferent anyone might know about them. I'm headed down there for their 2-wk CFI program in March. PM me if I don't post an update. It looks like a "15-Day" CFI course, but takes 3-4 weeks to complete, and a new class starts every month on the 1st. I've been thinking about them since I saw their booth at AirVenture in Oshkosh in 2018, but I'm going to try to finish up here locally this summer. If I don't have my CFI by Fall, I will attend a two-week wonder course somewhere to finish it up. Maybe this one if it's a good course with a good pass rate. I am still present at this location. Send a pm if you need more info. Here's the thing. I'm reasonably convinced that an average instructor candidate could start and finish a CFI within a month at a "non-program" school, especially if they have an above-average instructor. But that assumes the CFI candidate is motivated. Lots of folks become far more motivated once they've written a large pre-payment check. The nearest honest CFI to me is in Pontiac Michigan. I'm in St Joseph Michigan. That's a long drive, but I've done it before and I'll do it again. I work full-time and I'm remodeling my house. I've been doing lots of self study and was putting my CFI binder together over the winter, but I got distracted after discovering a hidden talent I have. So, I've been busy focusing on developing that and exploring whether it's worth pursuing or not. I think it will be. I have a lot going on. I need to be more focused on just one thing at a time. This might be the best way to keep my head in the game. OK, I'll bite. What's your latent talent you've discovered?? Sorry, didn't mean to derail this thread, but apparently I'm not too bad at painting. I had some pics on this reply, but I deleted them so we can stay on topic. I'll probably make a new thread somewhere more appropriate on JC with my paintings. Art is essence! ... Unless you were talking about painting walls and such, in which case, still awesome, but less essence! It's clear, to me at least, that an updated version of this transcendent movie MUST be the Coen Brothers next joint! Since I originated the thread. Does anyone know about this place? Good, bad or indifferent. Wait, huh? What was this about again?? I haven't dealt directly with them as ADS is a bit too far to drive but they have a decent reputation. As promised, I'm back with a debrief. I attended their course that ran from March 1 - 15. This is solely from my own perspective as a ThrustFlight CFI-Academy student. BLUF: 100% worth it. I'd do it again, but I did learn a few things, that would change the way I went about it. I took the course that included both ground and flight training. They now offer a CFI-No-Fly program, which is an 8-day ground-only training to get you your endorsement, as well as your Written Test Deficiencies endorsement. The combinded 15-day course gives that, as well as spin, and flight instruction, leading to a practical test endorsement, as well as the 2-calendar-month endorsement. Everything you need for the DPE. They provide the AFH, a FAR/AIM, and any POH you'll need for their planes. They also provide the ASA CFI test bank book. You will go through all of these in depth throughout the course. Your primary ground instructor is one of the best instructors I've had. They had a couple current/former instructors to teach a subject or two. They also bring in reps from regional airlines to pitch their cadet programs or any recruiting program. He is a wonderfully accomplished pilot, a proud veteran, and very well accomplished outside of aviation as well. He's a professional, and very approachable. He will do everything possible at the drop of a hat for you. Terrific guy. He'll go over everything you need know for the knowledge exams and Oral exam. The team of instructors I had were remarkable. Every one would give each student every bit of attention while they were talking, and did everything they could to help. The instructor cadre were also pros, and incredibly competent and personable. Schedule: Day 1 & 2 are full days of FOIs. They're a LOT to take in, and the better you know them before you arrive, the easier it'll be to push your limits on just how deeply you learn them. Your ground instructor guides you well. DO take detailed notes and detailed drawings. He will help you build a fantastic lesson plan portfolio. The remainder will be roughly 8-12 ground school, with the weekends "off." The remainder of the time will be put to use through self-study, lesson plan preparation, group study, practice teaching in the classroom, flashcards, written exams (if needed), etc. With few exceptions, students also have FULL USE of their classroom, whiteboard, and teaching aids. This time not in class will also allow flexibility for the entire class to schedule flights. BEST ADVICE: The office manager will schedule each student their flights, and they do a great job. However, if you have a definitive "get-out-of-town" date, be proactive. Schedule more flights, because weather happens. I was limited to 21 days, and had to squeeze in like mad, after having 3 flights weather-cancelled. The 15-day course includes 10 hours (including instructor). The more you can practice before arriving, the more efficient these hours can be. Know all the commercial maneuvers and ACS limitations before you arrive, that way you can focus on learning how to teach, rather than how to fly them well. This DOES include spin training/endorsement, if you need it. This 15-day schedule does NOT allow for a timely checkride as part of the course. That's not the purpose. What it DOES do is give you ALL the information you need to build upon your Commercial knowledge, skills, and abilities, and help you develop how to be an instructor of those KSAs. That being said, they will give you a list of DPEs in the area, and their contact info, for you to reach out and schedule what you need. You also have the option to discuss renting for extra solo practice. Take advantage of it. Realistically, lodging is a consideration. Flight training isn't cheap, and if you're traveling from out of town, shop for the best lodging, because it isn't cheap either. The cheapest hotel I found was around $75/night. A rental car is expensive for that length, so even if you drive from the coast, I recommend using your own vehicle. It'll ALWAYS come out cheaper, if you can handle the drive time. It also helps with the amount of pilot schtuff you have to lug around. Personal checkride experience. I earned my CSEL in 2006, so I've had a LOT of time to study & prep. I also had the fantastic opportunity to be a Civil Air Patrol Cadet Orientation Pilot, which allowed me to practice teaching for about 20-30 hours in the year prior to this Academy. (Any chance you get, take it!). I graduated the course on March 15, 2019, and was lucky enough to get my checkride scheduled for the 19th, and then re-scheduled for the 21st. The DPE I used was incredibly understanding and flexible. Afterwards, I was told there had never been anyone to take a checkride that soon after the Academy. This doesn't say anything about me, except that I HAD to get it done before heading back, and they were more than accommodating. Know your stuff before you arrive. VFR limits. Endorsements needed for each certificate (including Sport). CFI limitations. Student Pilot limitations (FAR 61.87 - 61.93). Having the exams done prior helps, but it's remarkably easy to walk up and take them pretty much on demand. You'll need to have them done before graduation, in order to get your "knowledge test deficiencies" endorsement. If you NEED to take your checkride while you're there, schedule it as early as practical (pun intended). Schedule as many flights as you can, and schedule early. Stay late. Ask questions. Be involved in class. Be a professional. Own it. Squeeze every ounce of value out of this course that you can. It's 100% worth it, and even more if you engage your instructors. Feel free to PM if you have any other specific questions! I'm always happy to help. P.S. I passed! It was ... easy, but anxiety building up for 13 years made me question myself on everything, and get stuck in my head. It's tough to power through, and move on to the next topic/maneuver, but did it. The DPE was crisp, and definitely made me prove myself. This is my review of the CFI academy that I attended March 1 – March 15th. 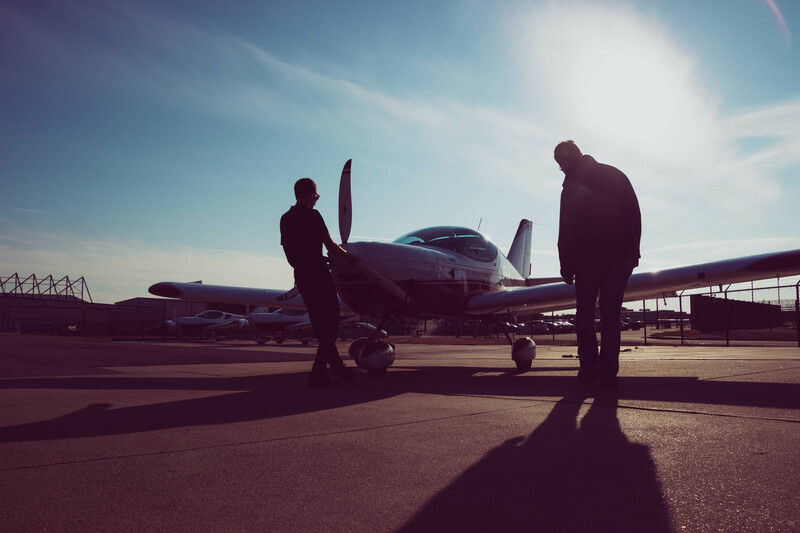 Thrust Flight is revolutionizing certified flight instructor academies. We now offer our exclusive "CFI No-Fly" academies, focused specifically on getting pilots through the knowledge portion of their CFI training. For a base price of $3885 – I only went over by about 300$ in additional costs for instruction. This was mostly due to their mock oral that they provide for an additional charge. As well as 2.5 additional hours of 1-on-1 ground instruction. I had a 55$ per night hotel plus taxes and fees. I spent around 300$ for required non-owned renters’ insurance. Since I was participating in the flight portion. The classroom training was fun and stimulating and the instructor Bob Choate was a dream instructor to have. Any questions you had outside of class he answered quickly, and he would tremendously help if there was something that you didn’t understand. Bob has the heart do what he does and specializes in flight instructor training only. Topics you were taught at the private or even commercial level are enhanced and taught in a very easy to understand and able to reteach to someone else with ease. (You will love the bicycle wheel). If your electronic device goes off, you are required to bring treats for the class the next day. If you do not laugh at the instructor’s jokes you will be removed from his will. For the flying portion you pay for 10 hours of flight instruction, anything in excess is an additional charge. You have to call the shots and take charge when you are doing your CFI training and take the role of the CFI and as PIC. If you continue to act like a student from the right seat, it may increase your training time. I took a mock oral as an additional fee and had a blast with it. Although I was more than nervous for it, it really showed me how well prepared I was to where I thought I was. Scheduling was the only issue I ran into while at thrust flight. I did not fly for the first time until the 18th day (3 days after the academy ended, mostly due to weather). You have VIP privileges for your first 5 bookings after that you are off to fend for yourself on flight schedule pro with the rest of their renters. This put my time out here to about six weeks with additional weather and aircraft unavailability. This program is very difficult to get in and out of in the 15-day timeframe unless you are very well prepared and use your time very wisely. (All written tests done, FOI knowledge, technical subject areas down cold). Becoming a CFI is about the teaching aspect which makes certain topics a little more difficult and forces you to really get into the material. I was not on a tight timeframe and not everyone studies or learns at the same rate. I spent six weeks in the area and haven’t regretted a single minute of it. As far as check ride availability I will be returning to my home base since CFI check rides here are delayed another 3 weeks. (Mostly weather-related delays again). Check ride fees in this area are $1000-$1400 for DPE’s. Thrust flight also offers a CFI-NO-FLY academy which is an 8 day course covering the same material as the 15 day course crunched even more. This allows you to go home and do the flight portion at your local flight school. I feel that either course is a great jumpstart to becoming a CFI if you do not finish there. I would highly recommend the 8-day no fly if you are on a really tight timeframe to keep costs low. As an added bonus if you attend either CFI-A academy you are allowed to sit in on any other CFI-A academy normal or accelerated for free, for life. I did sit in on a few additional courses from the next academy. TLDR - Long story short, they made the whole experience fun and I made some great contacts while I was down here, and I would gladly do it again. The airspace is a significantly more clustered than where I come from, but you will get used to the flow of KADS.